Decided yesterday not to run the NERRC Winter 10k this morning, and went to church instead. The knot in my calf was really tight this morning, reaffirming my decision not to run and I messaged it during mass, which helped a bit. My route from St. Vincent's to home goes down Kelly Drive past Lloyd Hall, where the race was staged. I figured that if I left right after mass I should make it before they pass out the schwag and catch some friends I knew would be in the race. Run was slow through Germantown and sped up a little when I got to the Wissahickon and the calf stretched out a little. I didn't check my watch but I had to be hitting 7:15's by the time I got onto Kelly Drive. My timing was pretty much as planned and I managed to catch a bit of the post-race social scene. That's the main redeeming feature of the Winter 10k, that you get to see folks you haven't seen all winter. This included a couple of folks from the Bryn Mawr club, JJ & EP dropped by, as did AH. KF finished third and TK ran as well. I hung out for about 15 and then continued my run home. Looking at the finish times, it would have been fun to run it. Finishing time was 35 something and there were two 36 minute finishing times. I could have been in the middle of that pack, perhaps won it. 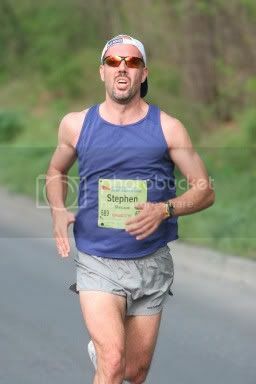 Like Bob Glover once wrote, some of my best races were those I never ran.